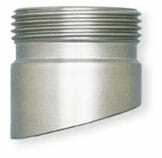 Standard threaded port, chamfered (15º angle), 25 mm i.d. This port style is the one most commonly found in the biotech industry. Proper installation will yield a side mounted port at 15° above horizontal. This angle is ideal for D.O. or pH measurement. The measured length is 40 mm from the top of the port to the bottom of the longer side. The electrode housing is designed to hold and protect the pH electrode while inserting it into the bioprocess vessel. There are various types of side entry ports and different groups of housings to fit each port type. The size and make of the port must first be identified in order to narrow the selection process. Found on nearly all vessels other than those manufactured by B. Braun Biotech. The port bore is 25 mm i.d. and the housing o-ring seals to the inside of the port. The housing is then secured to the port by a threaded retainer ring. The port is installed at a 15° angle for better electrode performance. See the cutaway drawing to the right for typical installation dimensions. Found exclusively on vessels manufactured by B. Braun Biotech. This style of port is longer than the standard port and needs a special housing to fit correctly. (Note: the port opening on newer tanks is 30 mm i.d. and the port narrows down to 25 mm i.d. at the critical point where the housing o-ring seals to the inside wall of the port.) Again, the port is installed at a 15° angle for better electrode performance. See the cutaway drawing to the right for typical installation dimensions.